Read the MG 6 hatchback (2011 - ) car review by Auto Trader's motoring experts, covering price, specification, running costs, practicality, safety and how it drives. MG is back! 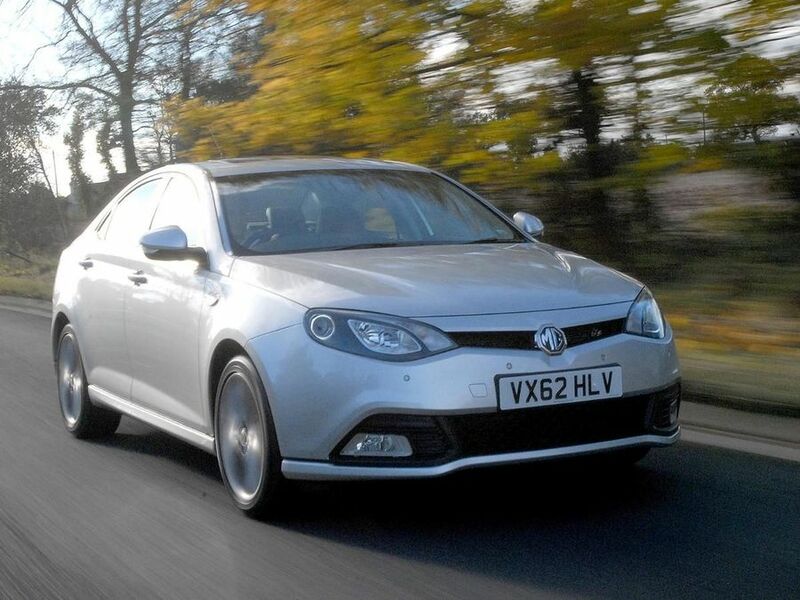 Despite Chinese ownership, the MG 6 is designed and built at Longbridge to take on the established family hatchbacks. It’s a decent drive, with sharp handling, and there's loads of interior space. Some serious flaws, though. Interested in buying a MG MG6? This is the first MG model to be built after a significant hiatus, so the fact it bears little resemblance to any other MG is probably a good thing. What it does share with them is the all-important badge, and the distinction of being designed and finished at the spiritual home of MG – the Longbridge plant. MG describes it as a “sports fastback”, but really that’s marketing speak for a reasonably sporty five-door hatchback with a slightly elongated boot. It’s a good-looking car with neat touches like front fog lights, a mesh grille, intricate headlights and sculpted bumpers separating it out from your everyday shopping car. To be honest, the interior of the MG 6 is something of a mess. The design of the centre console is fairly unique, but the strip of fiddly buttons that look too similar does nothing for ease-of-use. The driving position feels very awkward with a seat that’s too high and a steering wheel that’s too low, despite having adjustment for both. The rear visibility isn’t great, either, but it’s the quality that’s the biggest issue. The plastics feel cheap and flimsy, and the assembly doesn’t inspire you with confidence. Wherever you look, this car isn’t even in the same league as a Volkswagen Golf. There’s plenty of room for four adults to sit in comfort, with five occupants accommodated for shorter trips. The hatchback version is something of a segment buster, costing family hatchback money, but offering the interior space of a large saloon. Its 498-litre boot is significantly larger than the 316-litre boot of the Ford Focus, but not as big as the 550-litre Skoda Rapid. The MG 6 has been specifically tuned for UK roads and to uphold the sporting reputation of the MG badge. That means it’s quite adept at going around corners, with little body roll and a good flow of information through the steering wheel. Steering feel is aided by the fact it’s a part electric and part hydraulic system, unlike many of the full-electric systems on sale. The MG 6’s handling does come at the expense of a rather knobbly, unsettled ride, though, and there’s way too much noise to be heard when you’re cruising on the motorway. The MG 6 was only available with a 1.8-litre turbocharged petrol engine at launch, which kept it off lots of shopping lists. The engine itself has decent power from low revs, making overtaking relatively brisk. But, it is not an especially advanced engine, which feels decidedly out of step with the downsized motors making up Volkswagen’s TSI and Ford’s Ecoboost petrol line-up. Since launch, a 1.9-litre diesel engine has joined the range, which has been designed at Longbridge. With 150bhp and 258lb/ft of pulling power it gets the MG to 62mph in 8.9 seconds, and is capable of some seriously sprightly pace. However, the power delivery feels fairly all-or-nothing, and the engine is far too loud and gives off too much vibration. While competitors are offering low-emitting and high-mpg petrol engines, the 1.8-litre turbo can’t compete, with emissions of 184g/km of CO2 and an average economy of 35.6mpg. Quite frankly, that’s rubbish. The diesel is far better in isolation, with economy of 53.5mpg and emissions of 139g/km of CO2, both being perfectly acceptable for most owners. It’s still some way off the best-in-class, however. The Volkswagen Golf 2.0 TDI 150, for example, posts figures of 68.9mpg and 106g/km of CO2. Purchase prices are aggressive, but be aware that resale values will be weak. It’s difficult to comment on reliability until a significant number of MG 6s are on the road. Designed in Longbridge, the main components are then constructed in China, at which point they are shipped to Longbridge for final assembly. Driver, front passenger and side airbags are standard, as well as ISOFIX child seat mounts on the rear seat, anti-lock brakes (ABS) and Electronic Brake Force Distribution (EBD). SE and TSE models are fitted with a tyre pressure monitoring system. The MG 6 was awarded four stars in Euro NCAP crash tests, which isn’t great when you consider that the vast majority of cars tested these days get five. The MG 6 is available in S, SE and TSE trim levels, with air-con, electric windows, radio/CD player with USB and aux-in capability and alloy wheels all standard. SE adds sat-nav, rear parking sensors, cruise control and steering wheel mounted audio controls. TSE enhances the interior with leather sports seats, dual-zone climate control, front and rear parking sensors, heated front seats and Bluetooth hands-free. The chance to buy a car designed and built in the UK – particularly at Longbridge – is still a major draw for some customers. But, while the MG 6 has smart handling and good looks, it’s too far off the pace in too many other areas to earn our recommendation. If you’re looking for a low-price, high-value small family car, there are much better alternatives.